On this date in 1776, Robert Harley and Edward George hanged at Tyburn for murder. Harley and George are the postscript to a strange story already seen on this site — that of Smugglerius, the ecorche whose model might very well be Robert Harley’s brother Benjamin who preceded him a few months in death, for the same crime. A copy of Agostino Carlini‘s bronze cast of “Smugglerius”, displayed in Edinburgh. (cc) image from Chris Hill. The contraband in question for these smugglers was tea, and it’s not that tea was illegal — in Britain? never! The empire’s extension to India and China had sent Blighty tea-mad in the 1700s, even though the next century would be madder still, and the brew’s ubiquity had turned it into a magnet for taxation by a state that had world wars to fund. Tariffs on import tea rose and fell during the 18th century, and when they went up, well, tea got smuggled. At our moment in the story, tea imports to Britain are being taxed quite heavily,** to the flourishing of an illicit traffic: something like 4 to 7 million pounds of the stuff per annum. Tea leaked around the customs-men and into England everywhere but one of its most common vectors was riding alongside legitimate cargoes: captains and crew bound from the Orient would overload the hold, and stuff their personal effects to boot, with the lucrative leaf. At docks like Deptford — a common stopping-point for many seaworthy vessels where the Thames narrowed — the bustle of sea dogs and stevedores made it all but impossible to police what was coming off the bulging East Indiamen. This was the smuggling haven where this date’s tragedy began. Yet Andrews could probably attest that merely by virtue of its underground character, tea-smuggling was a dangerous line of work … as was suppressing it. One night in April of this same year, a quartet of customs officials having been tipped to a run of illegal tea along the Deptford turnpike set out to intercept it. Whether product of cunning counterintelligence or a mischievious informer, the tea peddlers were alerted to their hunters and in place of contraband sent up the road a much larger force of toughs that surrounded the taxmen in the dark. A witness would report seeing the chief smuggler, a character with the colorfully underworld moniker of “Gypsy George”† pay a bunch of brawlers half a crown apiece for their service as muscle that night. To read the testimony of a surviving victim, William Anchor, in the Old Bailey record of the trial is to come face to face with the elemental terror of crime in any age. but never mind it, come along; they kept very nigh us, we told them to keep back or we would shoot them; Pierson ran between the posts and the houses on the left hand side upon Deptford Green which leads down to Deptford Lower Water-gate; I kept in the middle of the green; he kept calling to me, come along; I said, here I come, my boy, for G – d’s sake don’t run so; he took the second turning that is on the right side, which leads into Hughes’s field: he turned in there, they cried out, B – t them, here they are, let’s sacrifice them: I heard Pierson cry out, O dear, one or two of the party followed him; there were five of them came down the green after me; I kept strait on, but I heard his voice. did not see Pierson again till about two hours after; he was then going into a boat; he had many cuts in his head, his left arm was broke, and his legs much bruised; his left ear was cut in two, and he was all over blood. To judge by the evidence of the goon who turned crown’s evidence against our luckless pair, it was just Pierson’s bad luck that he was the one of the four with a rage-addled Gypsy George on his tail. Gypsy George knocked him down with his stick, then we all hit him with our sticks that we had in our hands. Q. How long did you beat him? Gypsy George kept beating him about ten minutes or a quarter of an hour; the others did not hit him above one blow a-piece. Q. Did the two prisoners among the rest strike him? Q. Did the man cry out, or make any lamentation? Q. And all this while the two prisoners were with you? Q. What part of the body did they hit him on? Somewhere about the shoulder, or thereabouts; we begged of Gypsy George not to beat him any more, but we were afraid to prevent Gypsy George, lest the other smugglers should come up and use us ill; Benjamin Harley, and Robert Harley, and myself, begged of him not to beat him any more. Q. After this did you leave the man? We left him, and came away about forty or fifty yards; then Gypsy George said, He had not given him enough, he would go back and give him some more; Gypsy George went back, and we all followed him; Pierson had moved several yards towards some of the pallisadoes; Gypsy George heard him groan, and he gave him several more violent blows. Half a crown wasn’t enough pay to give this kind of thrashing, but it seems to have been enough to prevent anyone interceding against the boss’s fury. COURT. That is not evidence. Both were doomed on Friday to hang the very next Monday, with post-mortem anatomization into the bargain too. The trade in untaxed tea continued unabated on Tuesday. * Despite the categorical language in this post, it is not certain that either Benjamin Harley or Thomas Henman is in fact the source corpse behind Smugglerius. It’s been argued recently that Smugglerius might have been a different hanged man, James Langar. ** The tea taxes that so incensed American colonists amounted to the New World extension of the same policy. † Gypsy George was not captured; he surely would have hanged if he had been. George was rumored to have slipped into Newgate in a disguise to pay a secret visit to his erstwhile hirelings. ‡ Both Harley and George were coal heavers by day, another profession with a rich tradition of unauthorized economy. On this date in 1776, smugglers Benjamin Harley and Thomas Henman were hanged at Tyburn for murdering a customs-house officer who had intercepted them trafficking tea on the Deptford turnpike. One of these two gentleman might well be the flesh-and-bones person behind the ghoulish ecorche sculpture known as “Smugglerius”. 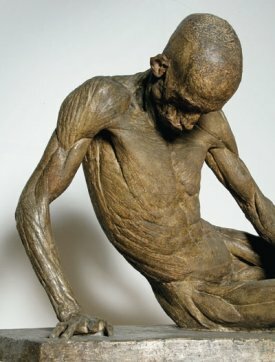 This beautifully ghastly item was commissioned of sculptor Agostino Carlini by the anatomist William Hunter: it is the cast of a hanged man, meticulously flayed of his skin to reveal the musculature for the convenience of future students’ sketches. Those students gave their subject the jocular nickname, since in life it was thought to be a smuggler. 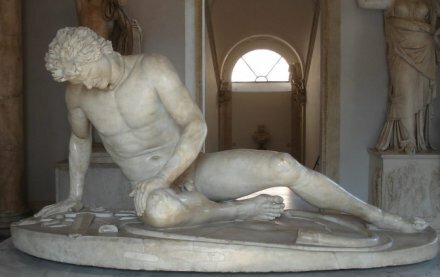 For good measure, Carlini posed the corpse in the manner of the Hellenistic marble Dying Gaul. Dying Gaul (known in the 18th century as Dying Gladiator), one of the world’s best-known classical sculptures. (cc) image from Tom Magliery. And unavenged? — Arise! ye Goths, and glut your ire! So that is Smugglerius, an astonishing artifact. For decades, it (actually a copy of Carlini’s original, which is long lost) has been parked at the Edinburgh College of Art, translating thence into countless students’ anatomical sketch pads. William Linnell‘s 1840 drawing of Smugglerius. One of the men bid me tell you, that Mr. Carter would give me half-a-guinea, at least, a week, for the first part of my time, and fifteen shillings for the latter part; but you will write to him, and ask him what he proposes: he is, just as they say, a blustering fellow, but a good man. I have seen two men hanged, and one with his breast cut open at Surgeons’ Hall. The other being a fine subject, they took him to the Royal Academy, and covered him with plaster of Paris, after they had put him in the position of the Dying Gladiator. In this Hall there are some casts from Nature that are cut from the middle of the forehead down to the lower part of the body, one part excoriated, and the other whole. With the direct reference to the Dying Gladiator/Dying Gaul pose, we seem very clearly to have a bead on the creation of Smugglerius, and the letter suggests that it was one man taken from a pair of hanging subjects. Conveniently (or inconveniently) there were just two such pairs of executions at Tyburn in the spring of 1776: those of Benjamin Harley and Thomas Henman on May 27; and, those of Samuel Whitlow and James Langar on April 12. Now, artist Joan Smith and anthropologist Jeanne Cannizzo have recently, and very publicly, argued that Smugglerius is not Harley or Henman, but James Langar — a man from the earlier hanging pair. This claim even teased an exhibition carrying the perhaps unfortunate title Smugglerius Unveiled. Deare dated his letter about the “Dying Gladiator” on May 1, so the executions must precede that date — which means that it’s one of Langar or Whitlow. Headlines aside, this sleuthing obviously falls well shot of airtightness. Harley and Henman were smugglers. You know … like Smugglerius? The historiography for Langar depends inordinately upon the present-day interlocutor’s confidence in the “1 May” date a Georgian-era teenager slapped onto a bit of personal correspondence with, one can be sure, nothing resembling academic gravity. May 1 could be mistaken outright (maybe it was June 1, and he wrote “May” out of the previous 31 days’ habit); or, it could be only a reference to when Deare began a letter that he might have composed over several weeks; or, it could be that the author had some trivial reason of personal expediency to backdate. Maybe so, maybe not. But who would have thought anyone would be interested in Harley or Henman (or Langar) going on two and a half centuries after their deaths. Executed Today had occasion to discuss this fascinating object d’art and its discomfiting origin with one of Hitchcock’s collaborators, IUPUI Professor of British History Jason M. Kelly. ET: What’s the background? Why is Smugglerius being produced at all in 1770s Britain? JK: Well, 1768 marked the establishment of the Royal Academy of Arts. It took over 20 years to create. The idea was to give Britain a school of art — of painting, sculpture, and architecture — to rival its continental peers. The French had established art academies in the previous century; they were among the premier art schools in Europe, if not the premier schools. The British didn’t have anything comparable. And, in an age of rivalries, both political and cultural, artists and patrons alike saw the Royal Academy as central to British national identity. 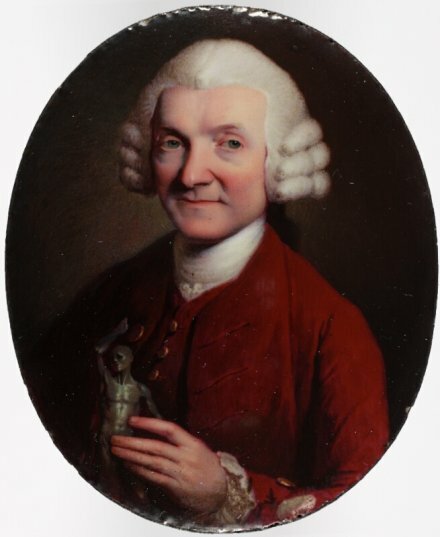 The Academy hired William Hunter to be the professor of anatomy. 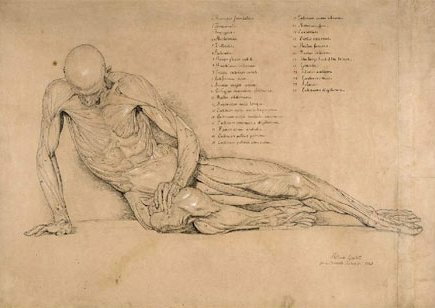 He was an anatomist — a doctor — by training, not an artist, so he was very interested in teaching things like musculature, skeletal structure, and the circulatory system. Smugglerius was not William Hunter’s only ecorche. He had made at least one other as a teaching aid, and he was proud to associate himself with it. He even poses for a portrait with a miniature version of it. What actually goes into producing an ecorche? They had to get the body from the gallows to the art academy. Then they flayed it. In this case, somebody decided to pose the corpse as the Dying Gladiator. They had some time prior to rigor mortis to get everything situated. in this case, they flayed him, posed him, then let him dry out, possibly overnight, so that they could make a mold of his body. Beyond its immediate use as a teaching device, it’s also an art object for appreciation in its own right. How do you read that phenomenon? This is very much a representation of the power of the state, the unrestrained power. The execution itself is a display of power, but the government went further when in 1752 it passed the Murder Act allowing the College of Surgeons to get six bodies a year to dissect. Ordinary people had no desire to have their remains used in this way. In the example of Smugglerius, the criminal was executed. Then, the body was desecrated — transformed into an art object for elite connoisseurs. The sculpture was meant to represent ideal beauty as well as the terrifying strength of the state. The very people who were meant to appreciate the model of the Dying Gaul were the same people holding the reigns of power. In a sense, this image reinforced the elites’ view of the world, both aesthetically and politically. 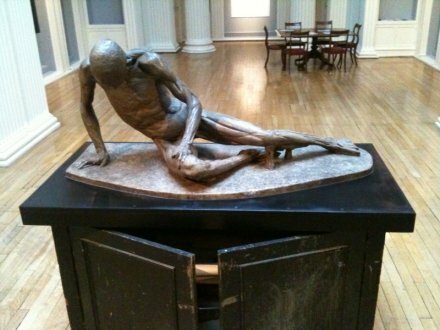 Why pose the figure in this way, as the Dying Gaul or Dying Gladiator? There’s one reading of Smugglerius to the effect that it was very subversive because the Dying Gladiator was seen as emblematic of the decline of Rome: the sculpture represented Rome’s decadence and corruption. an inveterate abuse, which degraded a civilised nation below the condition of savage cannibals. Several hundred, perhaps several thousand, victims were annually slaughtered in the great cities of the empire; and the month of December, more peculiarly devoted to the combats of gladiators, still [in the early 5th century] exhibited to the eyes of the Roman people a grateful spectacle of blood and cruelty … which had so long resisted the voice of humanity and religion. So, you could speculate that this pose slyly represented contemporary executions under the Bloody Code in the same critical way. The Gladiator was also one of the best-known and -admired classical sculptures in all of Europe, along with the Laocoön. In the 18th century they were compared as two examples of dignified dying. 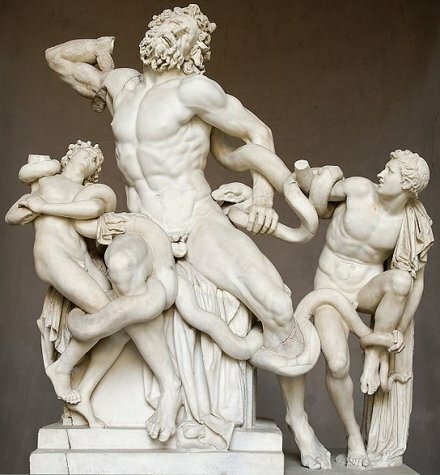 Contemporaries saw a certain stoicism in the sculptures — even though Virgil wrote that Laocoön cried out. Ultimately, Smugglerius reminds us what happens when power is unrestrained. In a world where most people don’t have a voice, the state can ignore the rights and dignity of individuals. The real story here is the story of arbitrary authority and the importance of an enfranchised citizenry with the ability to put limits on those wielding power. * Hanged felons not sentenced to anatomization could still wind up being taken apart in an operating theater, either as a result of their striking a direct bargain with the surgeons, or involuntarily via London’s growing trade in illicit corpses.